Click the expand button (bottom right) to view the video in full screen. 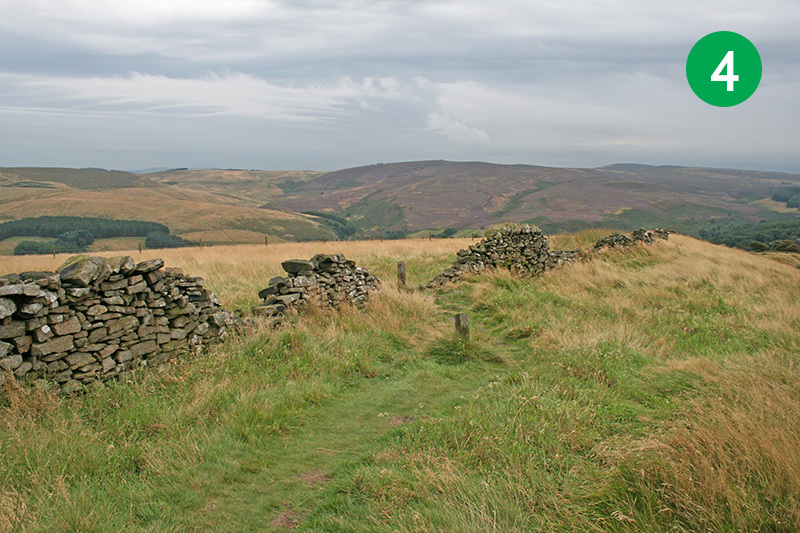 Recorded on a grey and damp mid-August day, this short circular walk is perfect for dog-walkers – and anyone who wants a quick leg-stretch – but prefers getting away from the more popular paths around the twin reservoirs. 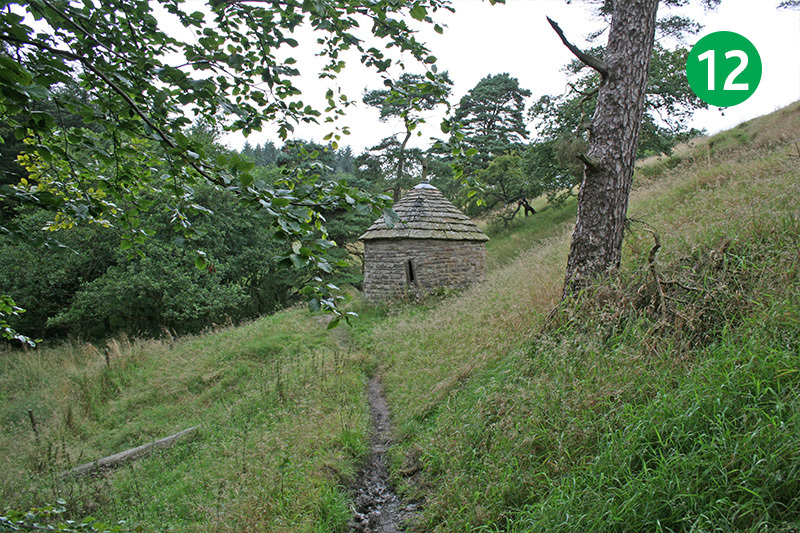 There are some wonderully panoramic views over the surrounding Peak District countryside, with the added bonus of a visit to the evocative circular stone building known as St Joseph’s Shrine. 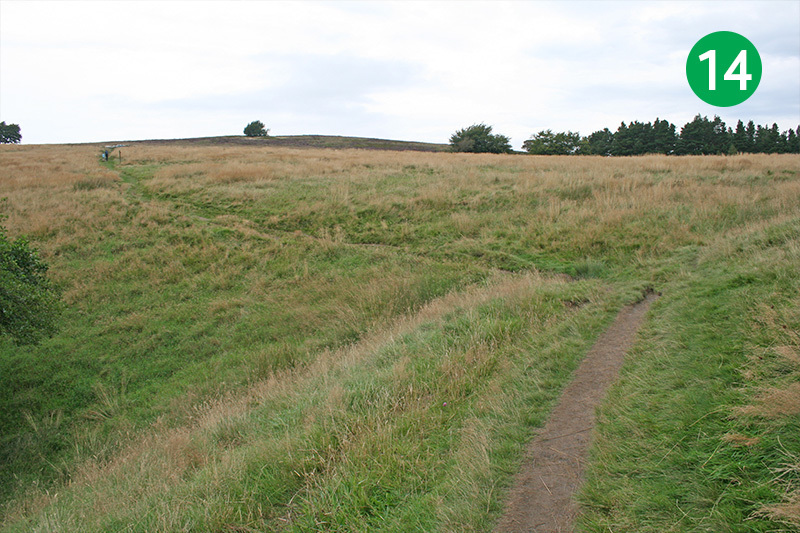 The walk starts from a small lay-by on the old Roman road known as The Street, which runs from the main carpark between the twin reservoirs, towards Pym Chair, and on to the village of Rainow. There’s only space for a few cars, so you may prefer to walk up from the main car park beside the reservoirs. Or my preference would be the small car park beside Pym Chair, walking back to the starting point. 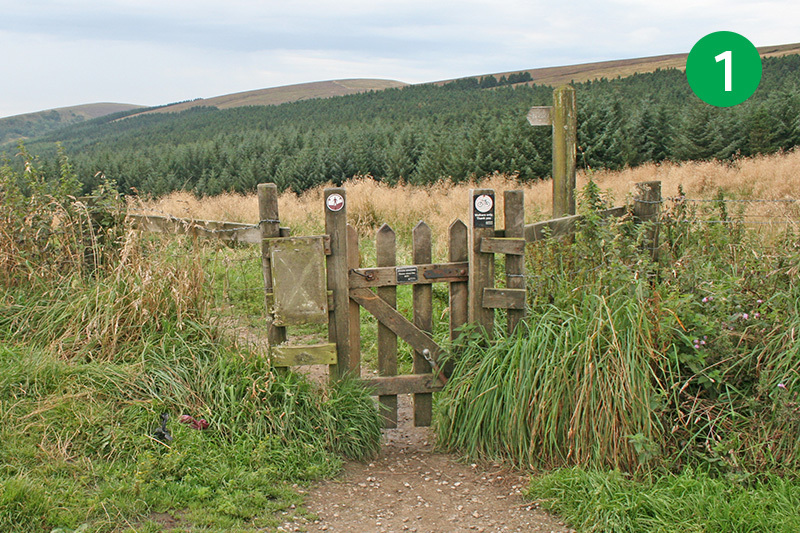 1: Go through the small gate just behind the lay-by and head diagonally left along the path, following the sign marked ‘Errwood’. 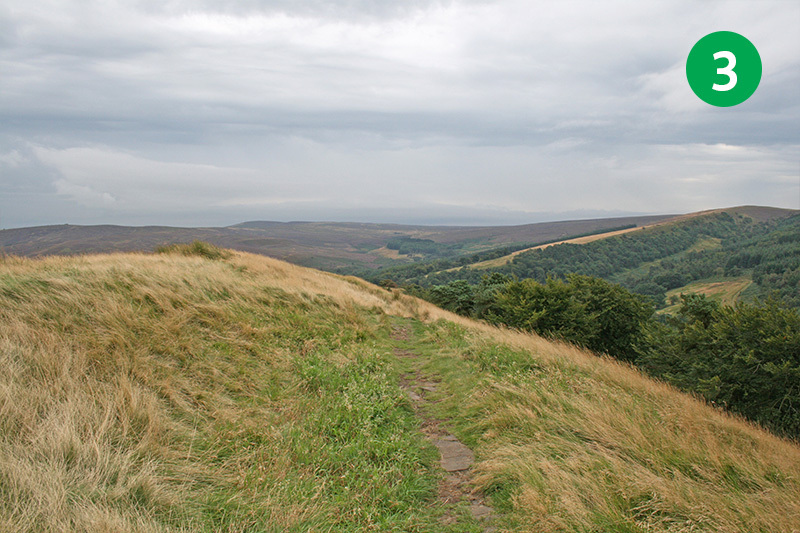 2: After a short distance, take the path on the left which heads up the slope, following the sign towards ‘Foxlow Edge’. 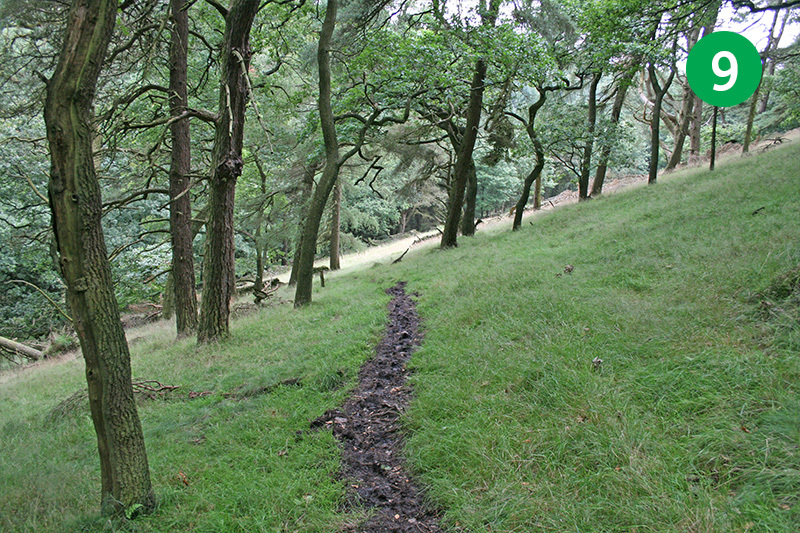 3: Keep following this narrow track across the moorland as it rises slightly to the right of the summit of the slope. 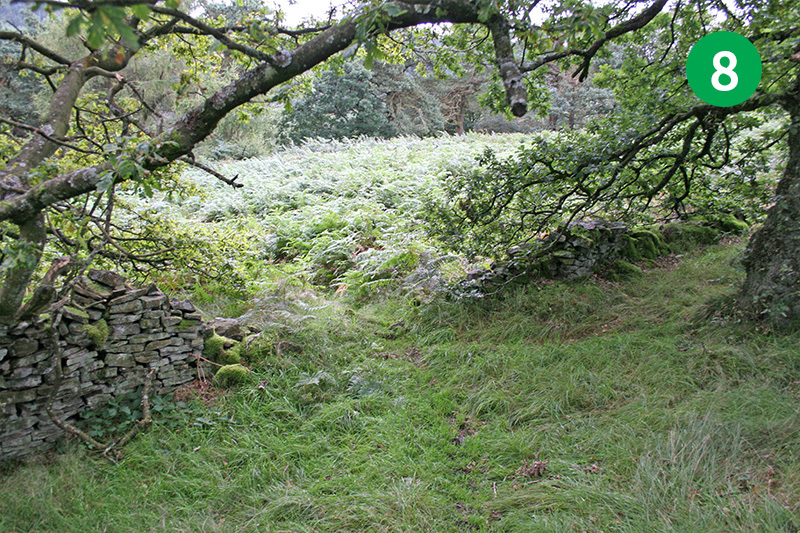 4: Follow the path through a gap in the stone wall, and turn right, keeping the wall on your right. 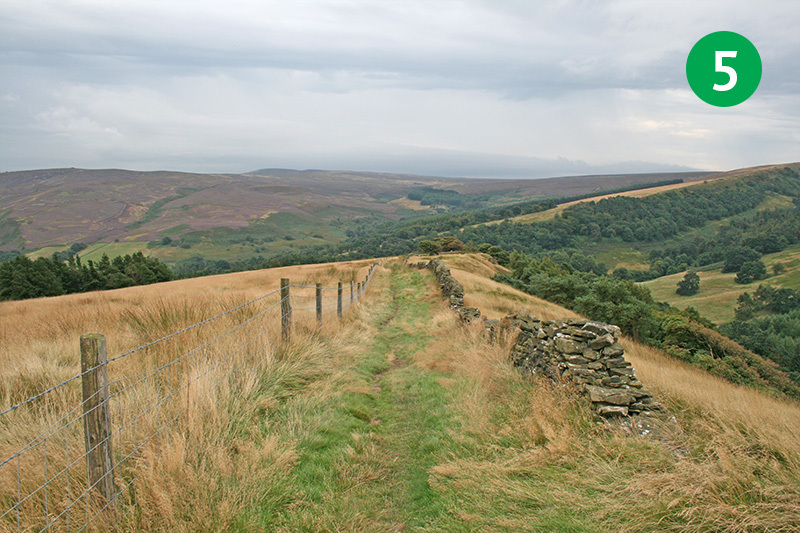 5: Walk down the slope, between a wire fence on your left and the stone wall. 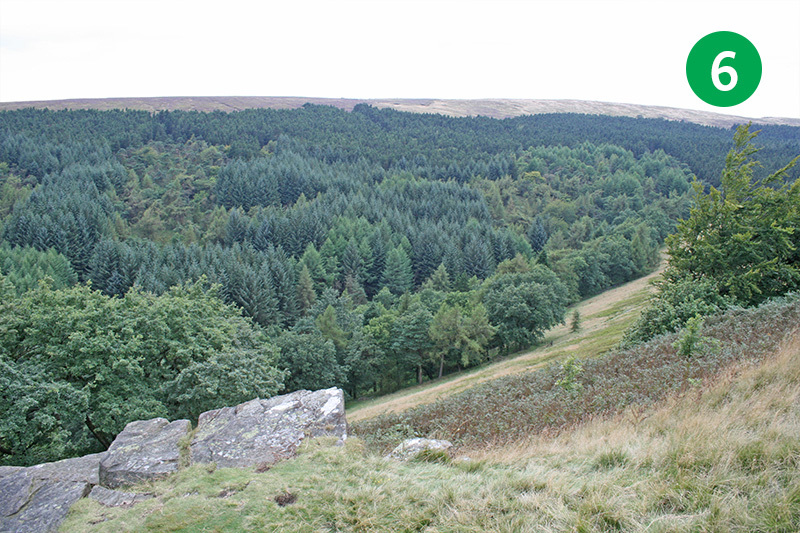 There are some wonderful panoramic views on your left, across the Goyt Valley, with Errwood Reservoir nestling in the valley below. 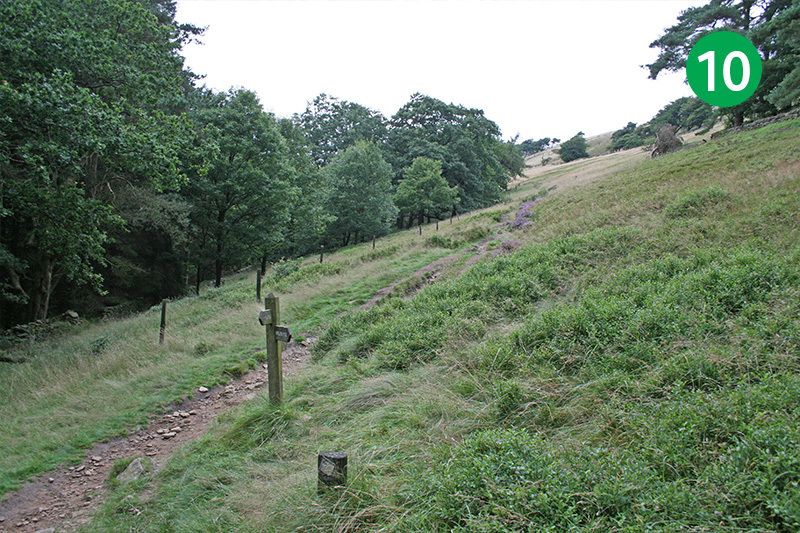 7: Walk further along the path until you come to a small footpath sign on your right. 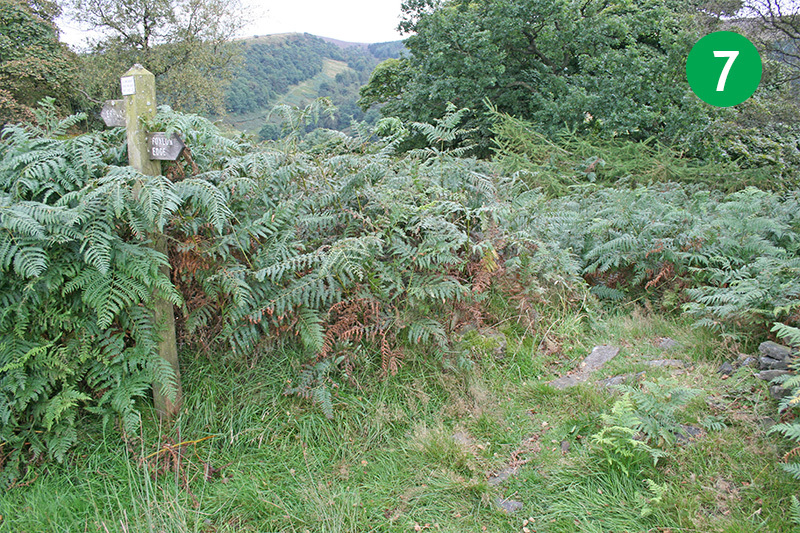 The track isn’t obvious, and can get overgrown with ferns, but turn right just before the sign and head down the slight slope. 8: The path soon becomes more clear. Follow it between a gap in a stone wall, heading diagonally right down the obvious track. 9: Follow the track as it passes through the trees. This section of the walk can get quite muddy after rain. 11: Continue for some distance along this narrow track until you pass the stone ruins of what was once Withenleach Farm (last occupied in 1835) and reach a fork in the path. 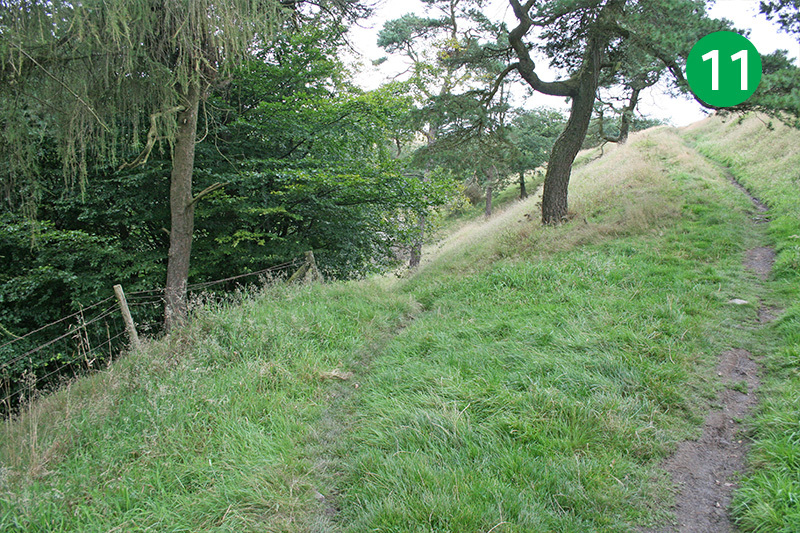 12: The path on the right continues to the starting point. Take the left fork down the slope to visit St Joseph’s Shrine, a small, circular stone building which I always find fascinating. Click here for information on the shrine. 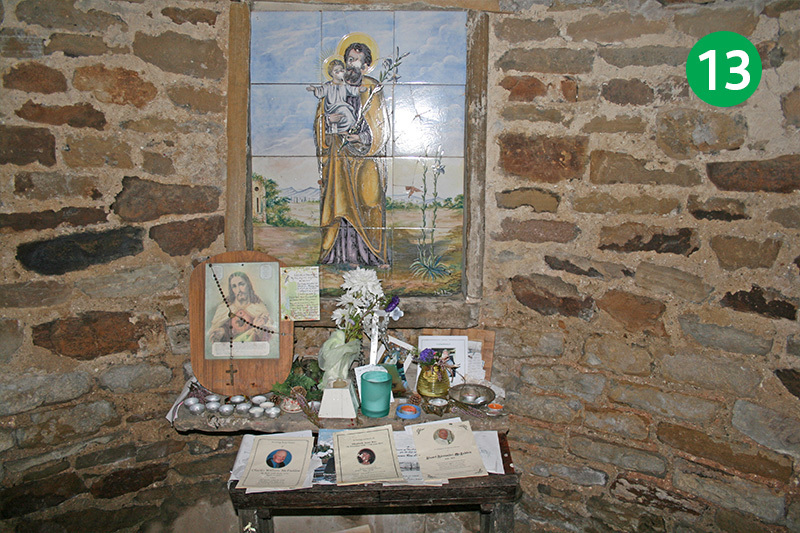 13: This catholic shrine contains many prayers and offerings left over the years by walkers. The coloured tiles showing St Joseph carrying the infant Jesus were sadly defaced some years ago. A plaque above shows the shrine was dedicated to Sister Dolores (D de Y) in 1889. She was a Spanish companion to the widow of Samuel Grimshawe, who once owned the estate and lived in Errwood Hall. 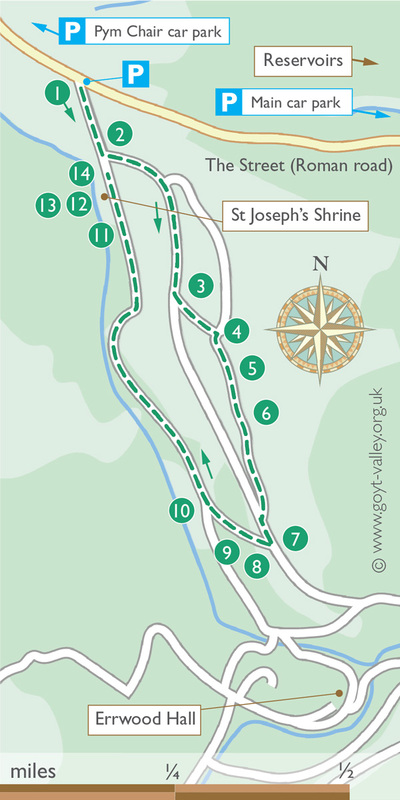 14: To continue the walk, head up the steps to the left of the shrine, and turn left along the track. 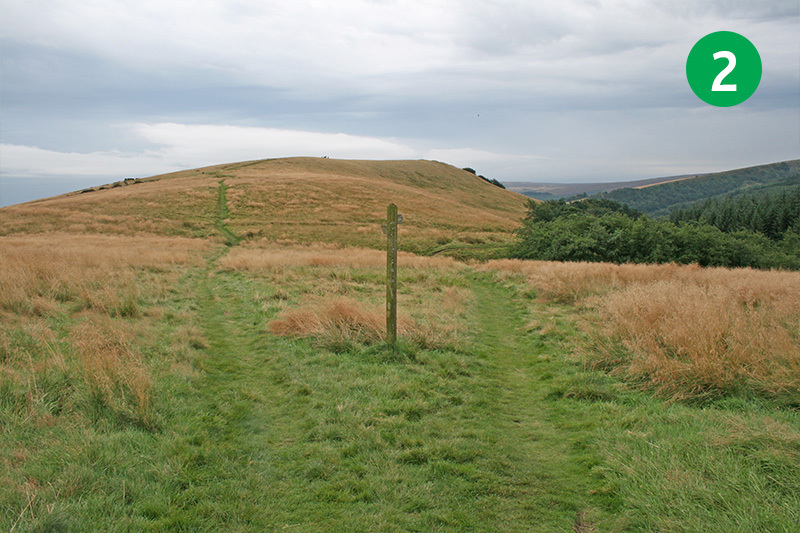 You will soon reach the starting point beside the old Roman road.